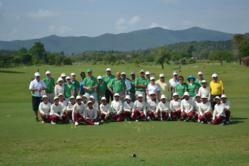 South-East Asia'a leading inbound golf tourism company has reported a record year and is planning further expansion in 2012, including additional staff and new destinations. Demand for our services was particularly strong during the traditional high season as more customers chose to use Golfasian for the superior golf holiday experience we offer. Golfasian Co. Ltd., South-East Asia's largest dedicated pure-play golf tour operator has reported a 68 percent increase in turnover for the 12-months ending February 2012. This industry-leading boost in golf holiday revenue is a direct consequence of growing popularity in Asian golf tourism and demonstrates the company's superior service quality and product diversity. Golfasian (http://www.golfasian.com) reported that year-on-year golf visitor volume rose 23.4% to 5514 golfers, while median revenue per person increased 29.1% to $US1450. Thailand accounted for 79% of the company's revenue, Vietnam 11%, while Malaysia and the rest of South-East Asia each contributed 5%. The company's golf stay-and-play packages continued to fuel growth, comprising more than 80% of total revenues. Tee-off golf packages accounted for 7% of revenue, while on-line golf bookings remained sluggish, contributing less than 3% of turnover. "In 2011 we witnessed a rapid build-up of Asian golf tourism," said managing director, Mark Siegel. "Demand for our services was particularly strong during the traditional high season as more customers chose to use Golfasian for the superior golf holiday experience we offer." Bucking the outsourcing trend of the travel industry, Golfasian has invested heavily in vertical infrastructure, including establishing regional offices in all of South-East Asia's golfing hubs, hiring dedicated local area managers, procuring its own fleet of company vehicles and drivers, choosing Singapore as its new corporate headquarters, and starting dedicated golf travel ventures in Vietnam and Malaysia. "Our expansion will further enhance the company's service reputation and market-leading position with both overseas partners and end-clients," Mark Siegel said. On the business development side, the company continues to maintain a remarkable online presence using its network of high-ranked web sites to attract new clients at a rate of 30 per day. Business Development Manager, Pascal Orczech, said that while most companies in the region were cutting marketing expenditures, Golfasian's spending had increased. "By reaching out to overseas agents and golfing clients, we've been able to convince them of the tremendous value of our golf tours, especially multi-destinations and those which combine golf and cultural travel. "This year, we will start to offer golf packages in emerging destinations like Burma, Laos, and southern China. These destinations, especially when combined with the traditional golf holiday areas, will further add to the attractiveness and uniqueness of our stay-and-play golf packages, while also being very affordable for most golf travelers." A privately-held Bangkok, Thailand based company; Golfasian was established in 1997 is the largest pure-play dedicated Asian golf tour operator. The company packages golf, tours, hotels, and transportation to offer clients total golfing experiences with exceptional quality, value and diversity.